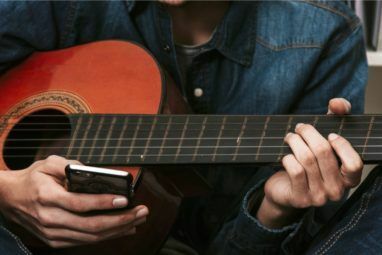 If you’re a musician of any kind, you’ve no doubt thought about getting some kind of pitch-giving app on your smartphone. For Android users, there are lots of different apps to choose from. However, whatever your instrument (but especially for guitarists), you should really consider using gStrings Free Tuner. The gStrings Free Tuner app is tiny, free and yet packed with features that will leave you with no need for any other tuning or pitch-checking application. We’ve got it listed as one of the Best Android Apps under Audio, but it’s about time we really showed you what it’s all about. At first glance, you can easily see that gStrings offers most of what the average musician needs in a tuning app. 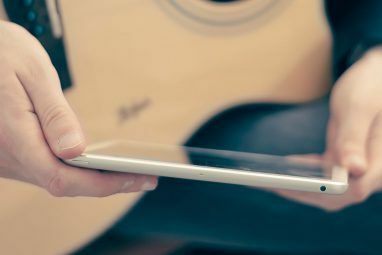 You can pick any note in a chromatic scale, play that note in the app to tune from or get the app to listen to your instrument playing it and show you how close you are to the right note. The display shows the note you’re aiming for in the centre of a swinging needle, tells you the pitch of the note in Hertz and then shows you the pitch of what you’re playing (or singing) in Hertz and on the visual display. This makes it easy to tune your instrument up or down and re-check the pitch until it’s right. In short, this application is ideal for most purposes. It acts as a pitch pipe and helps you tune your instrument. But that’s not all it does – There’s more. The microphone can be optimised to pick up the pitch range of your instrument as well as fine-tuned to be more or less sensitive as required. 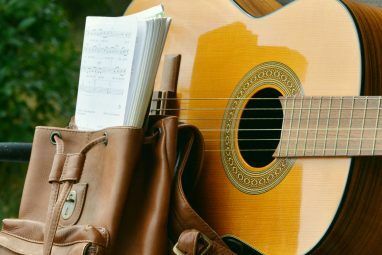 If you need to, you can change the octave of the notes you’re given to tune from, which will make it much easier to tune your instrument if you’re not using the original octave. For people who don’t use the ABCD naming convention, it’s possible to change to another system, such as solfege or AHCD. For musicians who need something more than a straight chromatic scale, gStrings offers some incredibly advanced tuning features which you’ll love. You can change the tuning to be orchestra tuning, which redefines A from 440Hz to 443Hz. You can even change the temperaments to be equal, meantone, just, comma or more. Native C can also be made more or less precise according to your needs. There are also even more options to tweak things including giving yourself more accurate markers in the display around the target note, FFT rounding or changing the scale range or tampering function. If you love the gStrings Tuner, you might like to know that they offer an ad-free version for 2€. 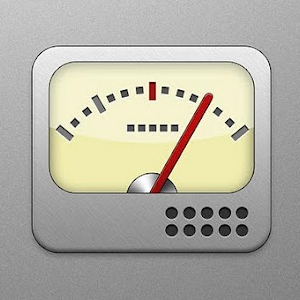 Plus, the same company also make a metronome app [No Longer Available] you should check out. What other Android apps do you think every musician should try? For Android, I prefer PitchLab [Broken Link Removed] , it's also free, with no ads, and offers way more than basic tuning functionality. The only mystery is why PitchLab is free because it makes all the other tuners - hardware or software, on any platform - look ridiculous. As a avid musician, there is no comparison.